On this day a week before, I was having the most heavenly cannoli – light crispy shell and a delicate chocolate filling. Sigh… no more here. But before I write more about that, here’s a recap of our trip to Sydney last week. After a restless 7 hours and 25 minute flight from KL, we finally landed at Sydney’s International Airport at about 9am Sydney time. I was suffering from somesort of a muscle ache on my right thigh, a peely and itchy chin from the dry cabin air and a grumbling stomach. Breakfast on the plane was a measly portion of yogurt (couldn’t take that because yogurt makes me puke) and a cold chocolate muffin (not interested). What happened to the days of nasi lemak on MAS flights??? Anyway, we had to wait for almost an hour for our luggage (I don’t know what happened…airport screwed up sending MH123 elsewhere) and then another hour or so in the customs queue. We were standing there for so long that the sniffer dogs probably got bored sniffing our bags for the goodness-knows-how-many time. At long last, we finally got out to the arrival hall close to 11am into the welcoming arms of my extended family members! It was so good to see them again. But I was STILL cranky, achy and hungry. So to cut the story short, we got home, hi hi hug hug and off to lunch we went. I had my Vietnamese pho fix No. 1 that day for lunch. Weather during our trip started off pleasant enough, but it was cold, wet and windy during cousin May’s wedding. But Aunty’s constant prayers were answered as the weather held throughout the ceremony and only started to pour like literally 2 seconds after May and Steve were announced as Husband and Wife and walked back down the aisle. Of course, the rest of us were scampering off after them with raindrops on our heads. It was a small, intimate but beautiful wedding -held at a little function bungalow with the ceremony out in the garden. Lunch and dancing was in a beautifully decorated room, with absolutely good food. Sydney is definitely a pretty city with breathtaking coastal suburbs that will make you wish you had a few million Aussie dollars to spare to buy a house overlooking the Pacific ocean. People are generally nice (except my cousin’s Italian neighbours who just wouldn’t smile at us no matter how many times we bump into them outside … what the….) and need I say more about food? We had dim sum, Vietnamese (fix No. 2 was a day after the wedding), seafood, Italian, Spanish and Chinese. I came back a kilo heavier (which is my weight gain achievement for pregnancy week 16). Bronte Beach - Wouldn't you want to wake up to this view every day? We survived our first plane ride since May this year. Needless to say, I was a tad nervous and not to mention quite uncomfortable all the way to Sydney. But being back where I used to be and being with the rest of the extended family soon banished all traces of fatigue (mostly) and we were eating our way through Sydney in no time! We literally just got back, so am still a little exhausted. But to sum it all for now, it was a wonderful trip, beautiful wedding and glorious weather! More later…. We started the road trip on a wonderful morning, bright sunshine, blue skies… but then it started to get real hot and no fun anymore after that 😦 I drove the first part of the journey up till Sipitang – a small seaside town in Sabah, and hubby took over from there. It was 2pm. I started driving at 7am. Overall it was an enjoyable road trip; passing the little towns, driving along the Crocker range, ferry trips across rivers and oh, not forgetting the hour we got lost at Lamunin in Brunei. Well, we decided to take the road less travelled… and I suppose it is less travelled for a good reason. We ended up driving in circles for a while. Oh well, at least we got some view of the Bruneian countryside… not much of it anyway. Very thankful indeed we had a safe and enjoyable journey. Kota Kinabalu was scorching hot and we spent most of the two days there eating, window shopping and watching movies. And I also caught up with an old college friend there, who was visiting KK for the first time with her husband. Here are some pictures, not many but we snapped some for the heck of it. Yay! We have reached Limbang! Out of Brunei, into Sarawak again. What?? RM8 and we have to fight for life jackets? What? We have to pay for the bedside bulbs too?? I am already feeling festive! And gearing up for our road trip. 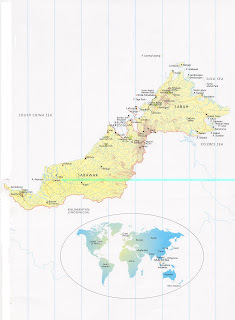 We will start early on Thursday morning and planning to get to Kota Kinabalu by late afternoon; while planning to stop by lunch in Lawas by noon or so. The total driving time is anticipated to be six to seven hours or so, with multiple stops along the way for immigration and customs check. Why multiple? Click on the above map for a clearer picture of our route. Every crossing from Sarawak (Msia) into Brunei and back into Sarawak and then to Sabah will require a stamping on the passport. So yup… no worries about not having enough rest stops. From Sidumin, it will be all the way through Sabah passing a few more small towns like Beufort and Sipitang. One of my favorite part of the journey is the route by the Crocker mountain range, where we drive by the endless green mountains until we reach Kota Kinabalu, sitting beneath the watchful peaks of Mount Kinabalu. One more working day to go tomorrow… then we’re ON THE ROAD! La la la! Hubby and I decided to relive our days of road tripping to Kota Kinabalu from Miri this coming Gawai. We’ll have a week off from work then, before Hubby flies off for a 5-week course in the Netherlands (boo-hoo!!). In about 2 weeks, we will be off, this time in a more comfortable ride. The previous two trips we drove my humble little mini car Kelisa. This time, we can take the Vios instead. Yay yay! I am brimming with excitement of what to pack, where to stop and all the quiant towns we will be passing by. It is going to be great… packed meals in the car, the ice box stocked with drinks and stopping by unknown little food shops. Brilliant ! I cannot wait! I spoke too soon in the last entry. Now, as I lie in bed typing this, I AM feeling tired. I have spent almost the whole of today travelling back from KL. Even though it is just a 2 hours and 15 minutes’ flight from KL to Miri, my trip started at 11.30am today to KL Sentral, then 28 minutes to KLIA, after which I spent some time waiting for my flight at 2pm. Then, it got delayed to 2.40pm, I was in the air for 90 minutes to Kuching, in transit for 40 minutes, delayed again and finally landed in Miri at 5.40pm. Disembarking, walking out the gate, taxi ride home blah blah blah…. finally closed the door at home behind me at 6.35pm !! And that, in Miri was almost dark. I am reading this book again because it made me laugh out loud when I read it 2 years ago. 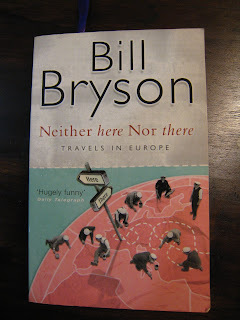 It might even help me with the current planning of our Europe trip next year. Hmm the more I read about my options on the web, the farther I am getting away from Paris. Do I REEEEALLYY have to see the Louvre ?